Americans spend a shocking 90 cents of every dollar on processed foods. This love affair with all things factory made has caused many of us to no longer be able to distinguish Real Food from the counterfeits at the store. Having run Real Food buying clubs of one form or another for almost 9 years, I have found that there is no single product that gets as many questions as buttermilk. When folks get real buttermilk from the farm for the very first time, they immediately discover that it differs from what they have been using at the store. The dissimilarities between the two is where the confusion and questions arise. Buttermilk is, in essence, a very simple food. It is the thin, milky, beige colored liquid leftover from the process of churning cream into butter. Maureen Diaz, author of Traditional Food Preparation Techniques, says that in the days when people churned their own cream into butter, slightly soured cream was the cream typically chosen for the task. Nowadays, fresh cream is preferred to soured cream as this results in a milder tasting, less strong smelling butter. Buttermilk that comes from churning naturally soured cream into butter is already cultured meaning that it is already inoculated with an abundance of beneficial lactic acid bacteria that have proliferated by fermenting the lactose (milk sugar) in the cream. This naturally cultured buttermilk is acidic enough (from the lactic acid) to be used for soaking flour for making pancakes and the like. Buttermilk that comes from churning fresh cream into butter is not yet acidic enough for this purpose, however, and needs to be either left on the counter for 1-2 days until it sours naturally or it can be cultured using a buttermilk starter. Another way to make cultured buttermilk is to culture the fresh cream before making the butter. Using fresh cultured cream results in both cultured buttermilk and cultured butter! Store Buttermilk is Not Real Buttermilk! 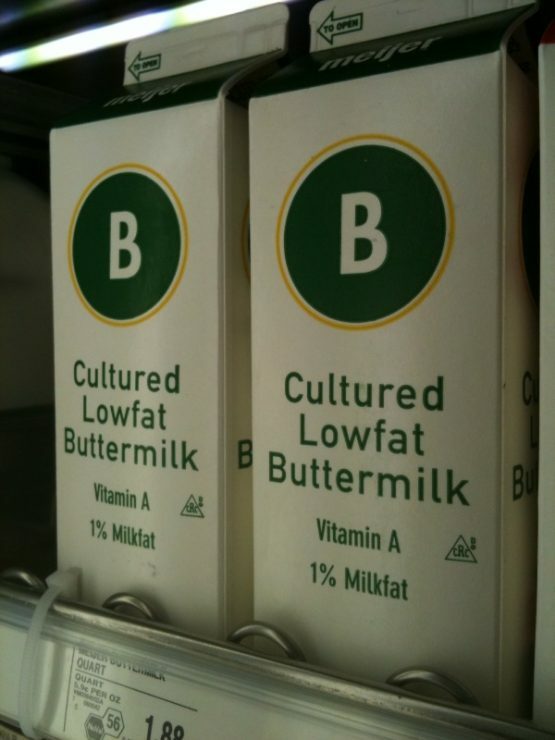 Be aware that the “gourmet” buttermilk sold at the stores is not really buttermilk at all. It is actually regular Grade A pasteurized whole milk that has been cultured with buttermilk starter. In addition, annatto is added to make the color of store buttermilk beige instead of white. Real buttermilk from cows on pasture is naturally off white to beige in color, but fake buttermilk made from milk (from confined cows eating grain and not pasture) is white. Hence, the coloring is added to fool the consumer and to make the fake buttermilk look more real! Incidentally, annatto is frequently added to store butter also to make it yellow to look like butter from pastured cows. Butter from confined cows with no access to pasture is white! Even dairy inspectors can mistake fake food for the real thing. One farmer I know who makes Real Buttermilk told me that an inspector that once visited his farm told him that his Real Buttermilk wasn't real at all because it was 30% butterfat. The inspector was apparently comparing the Real Buttermilk to the fake stuff from the store that is typically only 3.5% butterfat. The reason for the difference is because Real Buttermilk comes from churning cream into butter, while fake, watered down store buttermilk is made from whole milk. So, don't feel bad if you are new to Real Food and the whole buttermilk thing is a tad bit confusing. If you have read and understand this post it seems that you are way ahead of even some dairy inspectors! Sarah Pope, The Healthy Home Economist, is also the Weston A. Price Volunteer Chapter Leader in Tampa/St. Pete Florida. Visit her blog here: https://thehealthyhomeeconomist.com. Want the whole scoop on raw milk? How I healed my fungal infection…can you believe I’m sharing that with you? Me either! Just want to let everyone in on some basic facts about milk. I was born and raised on a dairy farm and my husband and I are dairy farmers with our three sons. I have 50 years of Dairy farming and cows have been my life. I get a little upset with quotes from people who have no experience with a cow. The comment that milk from grazed or pastured cow is not a white. All milk is white. There is no difference between grazed cows and confined cows milk. I have drank both types over the years. Our cows are out to pasture during their dry period before calving, but are in a free stall barn with free choice of feed at all times during their production of milk. They are free to move around to eat and drink and rest. Any time of the day you may go to the free stall barn and you will see happy, content cows either eating or resting and chewing their cud. The only thing that may changed the color is the fat content of the milk. High fat content milk from cows such as guernseys or jerseys may be a little darker. I have been drinking raw milk all my life. I would like to get into making some of my own buttermilk and other dairy products and found this website. Sad to say dairying leaves little time for other things and I have not had the time to try making some of my own dairy products. When cooking I like to use basic things and make my own thing from scratch. I don’t like to use mixes and other store bought products but I can’t say I never do. The trend for products is for local markets, but the requirements of producing a product to sell is very time consuming and expensive. How wonderful that you are creating food “from scratch” and trying to do good things for your family. You have been blessed with years of good health I am sure, from your years of dairying and raw milk! However, I have to disagree with you about the characteristics of pastured vs. confined cows. Let me first say that I am glad to hear that your ladies are not in tie-stalls, as many are-what a horrible life for those poor critters! We have raised our own family cows for many years and, as a Weston A Price Foundation chapter leader in my 11th year, I also have the privilege of knowing and working with many small, grass-based family farms. We have always raised jerseys, whose milk is naturally more yellow than white, and currently have a Jersey/New Zealand Friesian mix heifer who will be bred in the fall. Jersey & Guernsey milk is, of course, much more yellow than holstein due to the fact that these breeds do not fully convert the carotenes in grass to true vitamin A as holsteins due, although some bloodlines are more efficient at this. Goats also make a more complete conversion thus thier milk is also white. I don’t consider this a bad thing as with a good (human) diet a healthy person can finish that process in his/her own gut. We love the cream content of our cows and enjoy making all sorts of things from butter and buttermilk (cultured) to yogurt, kefir, cream cheese, etc. Holstein milk has significantly more water content and less solids, ie nutrients, than the old fashioned breeds. And, again, it will be much whiter for this reason. You did not say what breed of cattle you are milking, but this is a factor which influences the color of milk that must be considered. That being said, when any cows are fully grass-fed, the milk will definitely have more yellow to it, especially in spring and fall when the grasses and legumes are growing rapidly and high in carotenoids. Having access to pasture while being also fed rations (including sileage, baleage, and feed mixes) is not the same as “pastured” or all grass-fed. Our farmers, like my own family, intensively rotationally-graze their cattle on pastures made rich by their own droppings being worked into the soil and allowed to naturally break down into the soil. They are offered free-choice, natural (un-refined) mineral and kelp as supplements which are then also deposited in their manure onto the soil creating very rich and healthy pastures. In the winter months we of course feed grass and alfalfa hays. During this period the milk will be far paler in appearance, much less yellow or deep in tone. Our cows, like our many farmer friends, get very little organic grain, if at any. Being completely pastured means not only more nutrients in the milk and a yellower color, but an easier day with more time available to the farmer. When he is not burdened with the feeding of cattle, raising and harvesting corn, soybeans, etc., and not having to manage the manure & urine coming from the back end, he is free to do other things like make yogurt, butter, and cheese. His pocket book is far happier as well as there is a much smaller monetary input to produce a (smaller) quantity of (superior) milk which he can then sell either directly to consumers, or to a creamery which appreciates the quality of this milk! Additionally, cows out on pasture are far healthier with a greatly diminished need for vets and associated bills. The cows birth with very, very few problems. I can tell you that this has certainly been the experience of every one of my family farm friends who switched from conventional dairying to a much more relaxed, pasture-based system. Every single family has told me the same story. One family went from $100+ monthly bills to a single $100 bill in an entire year, and that being for a horse that ran through a barbed wire fence! So you see, when dairying is done on a truly grass/pasture-based system, it has a multitude of advantages, not the least of which is the quality of milk produced. And it won’t be pure white! I would encourage you to investigate if these these things are not true by finding and talking with a completely pasture-based grass farmer in your area, and look at the ACRES USA, Weston A Price, and Graziers International websites. The information you find there may amaze you, if you read it with an open mind. Just listened to a video on youtube about setting out your raw milk and it will turn into curds and whey. Part 1 Raw Mozzarella Recipes- http://www.ChefOfThePeople.com at https://www.youtube.com/watch?v=CvZEHbYG8G4 I like him because he keeps his cheeses raw even ricotta. And that’s what its all about, isn’t it! To get the ricotta recipe I believe there is 3 parts to it. Also he tells you about leaving out the whey for 2 weeks to make a starter for your cheese. The cheese sounds like a great options . . . can I still make cheese if the buttermilk has been frozen? thankie dearie will check it out, now where is that linky? i wanna be first for once! hehehe…. Oh sarah what an awesome article! I am laughing a little bit for two reasons. One, I had a recipe that called for buttermilk a few months back before I had my raw dairy delivery and I went to buy some and saw the 1% milk fat etc. and decided not to buy it. I got some regular whole milk and put a teaspoon of cider vinegar into it and left it for a few hours–bam, cultured MILK but of course, as you said, not butter milk! I have half a gallon of sour milk from when I was away and decided to figure out what to do with it. If it had been pasteurized, it would be rotten, but now its simply sour. Anyone have any suggestions on what to make with it? it has quite a bit of cream in it! Will subscribe to the comments here and hope someone has something neat for me to try! Alex, I have just the post for you! Home Cheese Making by Ricki Carroll. bit or maybe not at all. it just depends on how “sour” you want it. i skipped this step altogether, due to my lack of patience. separated well just under 180. 3-4 hours; i left mine out overnight. it lasted less than a day for us! Wendy, I loooove that recipe& want to try it? Thx! Our family of 9 goes through 30metric litres (7gallons? )of raw milk a week and at present we are making a lot of ice cream.we were making butter out of the cream and I was using the buttermilk to soak all my grains-most specifically I used the buttermilk as the liquid in my bread dough and I found it spectacularly successful.It produced a very lively dough.I did make a bit of ricotta out of the buttermilk and it was tasty but my need for a soaking medium used most of the buttermilk.My husband had the idea of tipping the buttermilk back into the drinking milk but the kids and I found it was horrible like that. I would still like to find a use for the buttermilk left from making sweet butter . . . just as it is . . . ? ? ? And, figure out what it should replace in recipes (milk, water, etc.). I’ve used this buttermilk (leftover from making butter from our raw cream) in all sorts of recipes calling for buttermilk or milk. It works just fine. Will use the leftover whey the same as I do from yogurts & the buttermilk – in place of buttermilk, milk or stock (for breads) in my baking. Thank you both! This clears up a few things for me. Ok could you take the left over milk after making butter and place it in your fresh raw milk and let it sit and sour, would it make good buttermilk for cooking. Yes, you need the acidity of cultured buttermilk in order to soak grains, but with all that other buttermilk leftover from making sweet cream butter, I’m thinking that could just replace the liquid in other recipes that don’t need soaking, right? I think that’s what Barbara is trying to figure out. I have read that when a recipe calls for buttermilk, to use cultured buttermilk not the milk leftover from making butter because it needs the acid from the culture. I have also read that you can, however, use whey when a recipe calls for buttermilk. I have tried it successfully in baked goods – just another good use for whey! Definitely, Kelly. 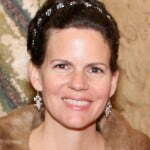 Maureen is a wealth of info .. she will be a speaker at the WAPF Conference this year, by the way. Let me shoot her an email and see if she has a moment to comment. Also, I was thinking more about this thin buttermilk .. where in the world is the 30% butterfat question that Katie had. I was thinking .. you know, the Green Pastures butter oil is liquid and obviously quite high in fat. Maybe that’s the type of liquid fat leftover in the buttermilk that is accounting for the high fat content? It just seems so counterintuitive, like so many things about Real Food! Sarah, I wonder if Maureen would have more ideas of what to use buttermilk for & if it can be used to replace liquids in other recipes as Barbara asked… I’m thinking, why not, right?? Hi Katie, great point – I thought the same thing .. that the buttermilk would be very low in fat – but my farmer says no, that his is around 30% butterfat and the inspector confirmed this when he tested it and told him that his Real Buttermilk wasn’t buttermilk at all because the butterfat was way to high in comparison to the typical 3.5% butterfat like the stuff at the store! Very funny thing of the inspector to say! You do not need to scald; this is a holdover from the way of thinking which states that all milk must be pasteurized, or innate cultures will interfere with the final outcome, or also that raw milk is dangerous. When I first tried my hand at making butter (of course sweet cream), I had all this thin buttermilk and couldn’t find anyone to answer “what do I do with it?” Although it’s not as thick as regular buttermilk (store bought or home cultured), it did okay in some biscuit or pancake recipes. I much prefer the cultured version, which is considerably thicker. It still doesn’t act like when I make buttermilk with a culture and whole milk, though. That is much thicker and creamier yet. Isn’t buttermilk, the by-product from making butter, nearly devoid of fat since all the butterfat should be in the butter? Great post. I haven’t gotten into making buttermilk because I haven’t found anything that I couldn’t use kefir for – to replace buttermilk. Does anyone else find that also? This is the problem I’ve been having. I make butter, but I haven’t really been able to figure out what to do with all this copious amounts of buttermilk I have from making the butter. It’s been sitting in my freezer waiting for me to figure it out. I’ve made sweet cream butter, so I’ll have to culture it before it’s much use to me, but most of the things I need a sour acidic liquid for, I use my dairy kefir instead. Joy, the buttermilk is delicious to drink. And, if you either culture it with buttermilk culture or let it sour on its own, it is also good for baking, etc. It imparts a *different* flavor than kefir, one which I find very pleasant. Additionally, you may cover a piece of meat with buttermilk in a glass container, cover, and it will tenderize and preserve the meat for weeks, even months! Maureen, I’m curious… When using real buttermilk to preserve meat, does it need to be the cultured buttermilk, or does the fresh, non-cultured buttermilk (left over from churning sweet cream butter) work for this as well?